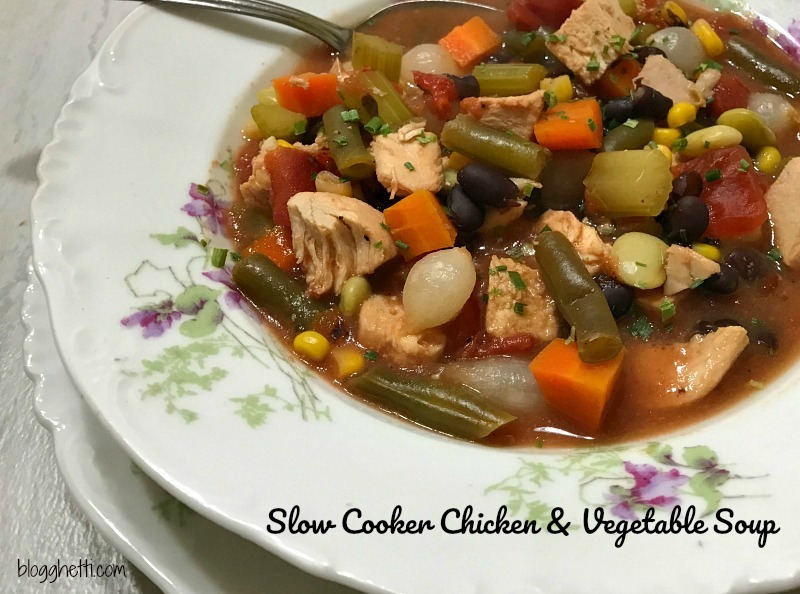 This slow cooker chicken and vegetable soup a hearty meal that is perfect for a chilly night’s dinner. Simple to prepare as the slow cooker will simmer this delicious soup all day long and be ready when you walk in the door. This chicken and vegetable soup in my slow cooker = perfection. I have several “let’s save this tiny amount of frozen vegetables for soup” bags in my freezer. It’s also a good way to use those fresh vegetables that are seeing their last days in the refrigerator. I wish I had some zucchini to put in there but I will be happy with what I did have on hand. The best part of this recipe is you can make it your own. Add whatever vegetables you like. I like to make huge pots of soup so that I have leftovers for the next day or to freeze in individual containers for a fast lunch or dinner when things get busy. Pair it up with a either a yummy grilled cheese sandwich or a salad. Or, just have a huge piece of crusty bread on hand to dip in the broth. Anyway, you choose, it’s gonna be good! It’s healthy! Full of flavor with the vegetables and protein from the chicken! You can use low-sodium or salt-free chicken stock to cut down on the salt. Add salt to taste, if you must. Truth be told, I use an unsalted chicken stock and do not add salt to the soup at all. The fire-roasted tomatoes, oregano, garlic, and pepper add plenty of flavor to this and the added salt won’t be missed. If you want to add noodles here’s a good tip: Cook the pasta separate from the soup. Don’t add it to the slow cooker while the soup is cooking. When you reheat the soup, the noodles will soak up the broth and you will not have much left. Simply add the noodles to your bowls and then pour the soup over. If you freeze it, don’t freeze the pasta with it as it will absorb the broth. Of course, you can add extra broth to the container you are freezing. Whether you have this soup with noodles or not, it is a make again recipe! This slow cooker chicken and vegetable soup a hearty meal that is perfect for a chilly night's dinner. Simple to prepare as the slow cooker will simmer this delicious soup all day long and be ready when you walk in the door. Add everything into the slow cooker and turn it on Low for about 5 hours. Dice or shred the chicken and place back into slow cooker. Let cook another 45 minutes to one hour. Spoon into bowls and serve. Or serve over cooked egg noodles. * I love fire-roasted tomatoes in place of plain diced ones but those can be used in this, too. I recently found fire-roasted tomatoes, salsa-style. It has jalapeno and Anaheim peppers in with the tomatoes. Sort of like Rotel, which could also be used. Give the soup a bit of a kick.